Why not ball-shaped handgrips? And check out that comfy looking seat. 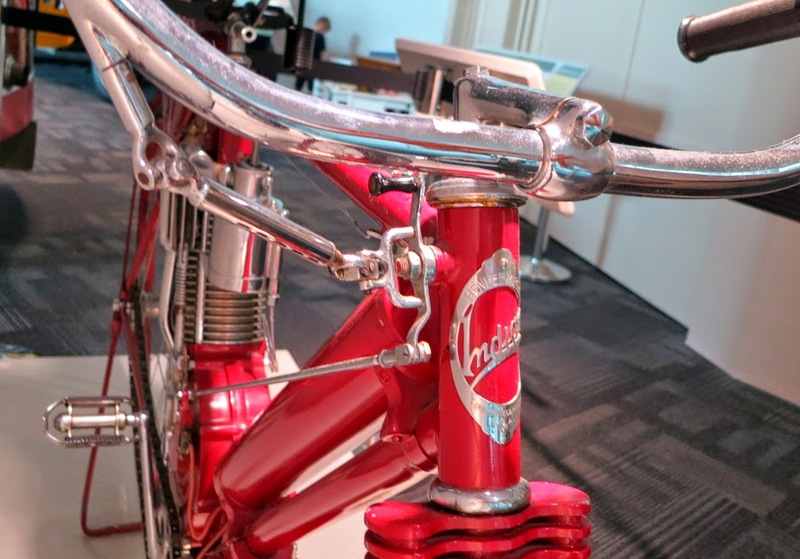 Modern motorcycle customizers might take a few hints from the designers of the world's early bicycles (Royal Enfield among them). I came to this conclusion while touring the fascinating Elliott Museum in Stuart, Fla. 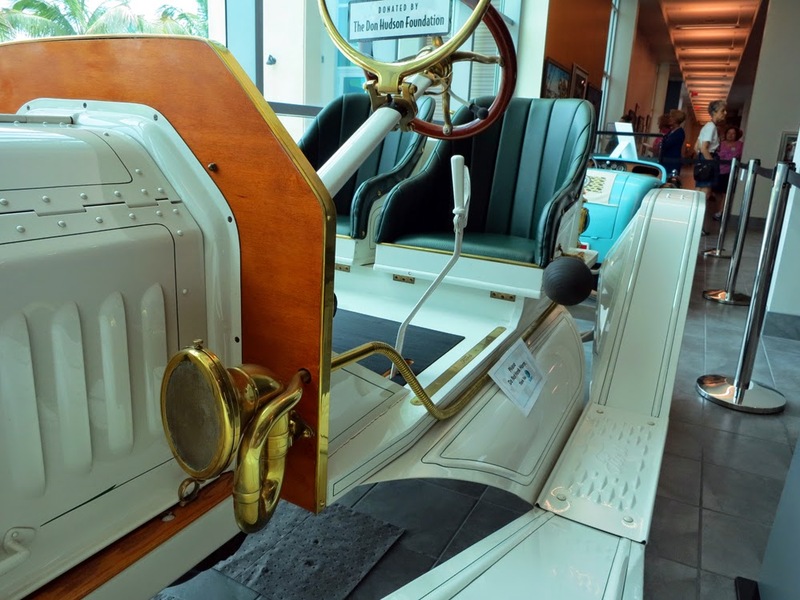 The museum is housed in a spacious new building with plenty of room for its impressive collection of automobiles, baseball memorabilia, Chris Craft speed boats, Evinrude outboard motors, and dresses worn by movie actress Frances Langford. The diversity of items, from a wedding dress worn by five brides to a voting machine used in the "hanging chad" Florida election debacle of 2000 — and even a few very special motorcycles — might seem confusing. 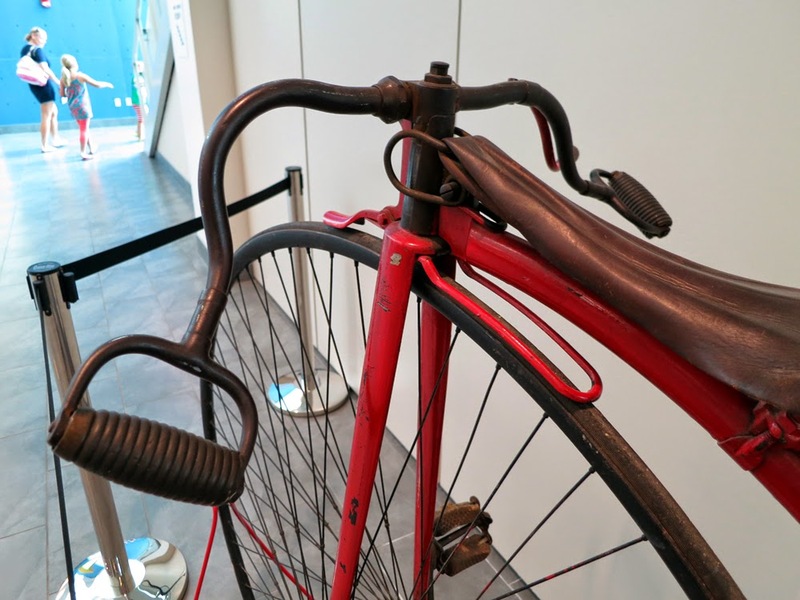 Hand brake rod disappears into the frame tube, then emerges behind the fender to press a shoe directly on the tread of the rear tire. It's not clear to me how the handlebars can still rotate. It helps to know that the museum is named for Sterling Elliott, an inventor of broad interests who, with son Harmon, held 200 patents. Harmon Elliott founded the museum. Almost nothing escaped the Elliotts' inventive minds. 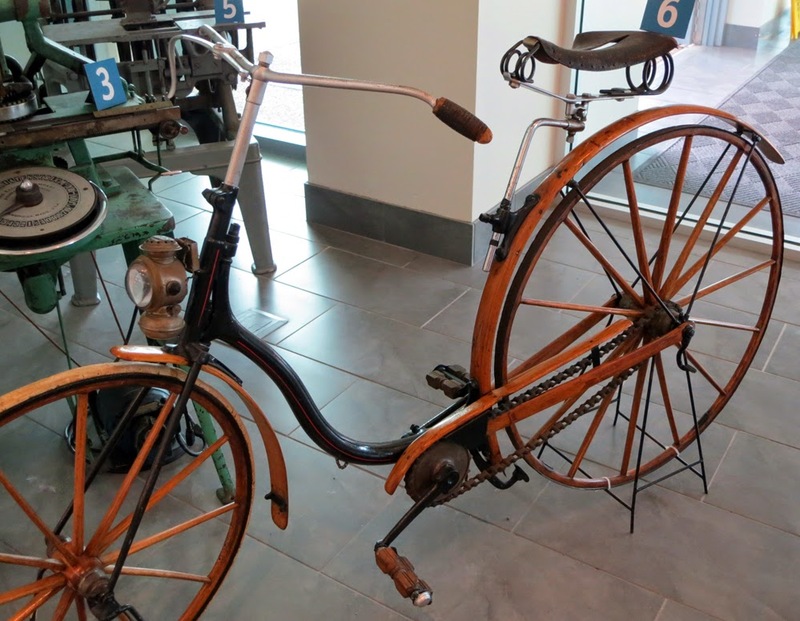 The museum houses an example of Sterling Elliott's 1890 quadricycle, with its non-turning front axle (Patent No. 442,663) that would be critical to the modern automobile. Its knuckle joints freed the car from the horse-cart-style front axle that swung the front wheels around a fixed center point. The ground breaking quadricycle also featured toe-in for the front wheels, a differential rear axle, four-wheel independent suspension and self-equalizing brakes. 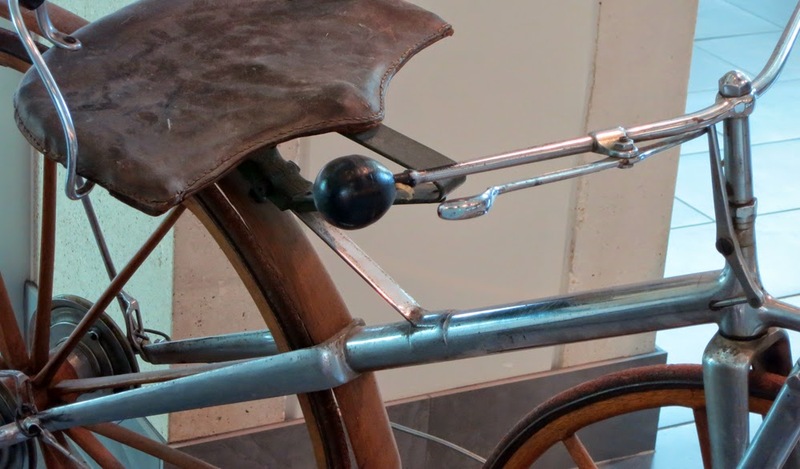 Another disappearing act on this 1904 Indian; throttle connection to twist grip emerges from the handlebar, then travels through two U-joints to reach the motor. It belonged to Harmon Elliott. If it had a motor the quadricycle would have been a great automobile, but Sterling Elliott was more interested in improving the design of human powered machines with two wheels. He was in a position to do so as publisher of the influential "The Bicycling World" magazine. There was even an Elliott Bicycle company, for a time. 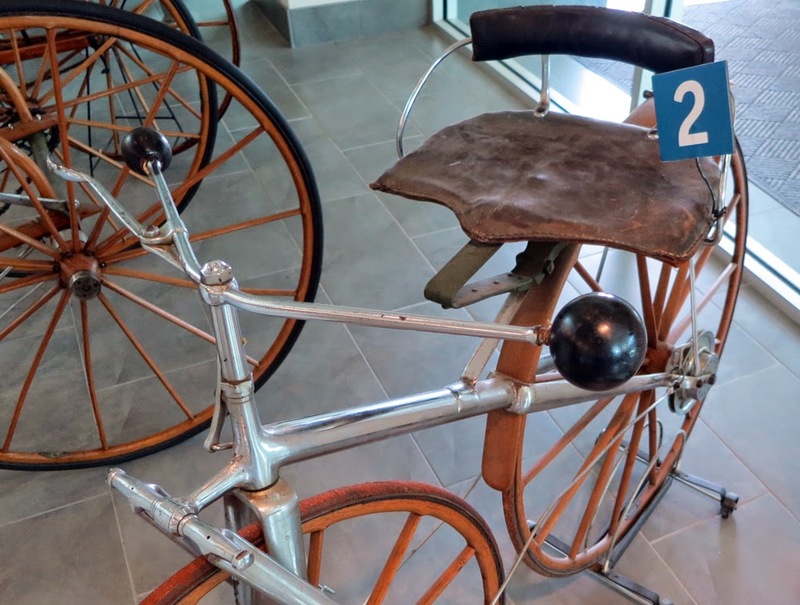 What I found fascinating about the old bicycles on display was the workmanship and clever solutions to problems that might seem incidental, such as seating comfort and convenient braking. Handgrips that really ARE grips on this penny farthing. This attention to detail is especially notable because some major aspects of the machines strike me as wildly impractical. Elliott felt that hickory was adequate for frames and wheels, for instance, and ridiculed the notion that they wouldn't hold up. Ummm. Maybe. These things look more like patent models than vehicles you'd take out on the road. Step-through for ladies. Note the rear fender functions as seat post! Oddly, Sterling Elliott is often remembered only for pioneering the design of step-through frames to accommodate women bicyclists. This was a time of active opposition to the idea that women should bicycle at all. Elliott's design put him in the position of being an advocate for women's rights. not to succumb to temptation to blow it.